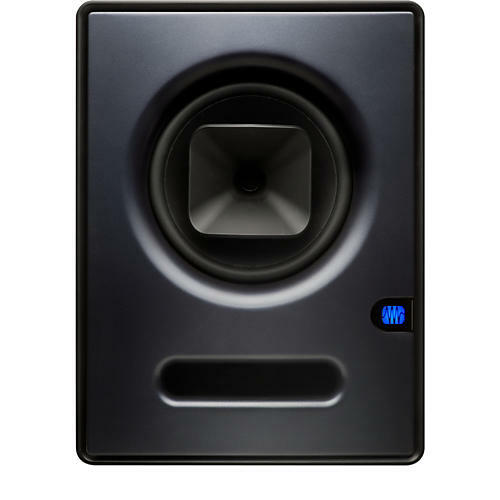 The PreSonus Sceptre CoActual high-definition studio monitor takes its name from an age-old symbol of royal authority. This 2-way studio monitor will help you to discover the fine nuances of your music that can not be reproduced by conventional desings. The Sceptre's panoramic soundstage, fine detail, and stunning dynamics will astonish you. This exceptional performance is the result of an advanced coaxial design that works integrally with a 32-bit processor running Fulcrum Acoustic's TQ Temporal Equalization Technology. However, Fulcrum Acoustic's amazing, cutting-edge technology has allowed PreSonus to overcome the usual design problems of coaxial systems while taking advantage of coaxial's unique properties. Thanks to custom transducers and TQ algorithms designed by Fulcrum's Dave Gunness, Sceptre CoActual monitors deliver clarity and coherence that has previously only been available in ultra-high-end systems. Each Sceptre monitor contains a DSP chip that enables the use of Fulcrum Acoustic's TQ algorithms. The processor is used to manage horn reflection, linear time and amplitude anomalies correction, performance contouring, and dynamic and excursion limiting. A four-position Acoustic Space switch controls a second-order shelving filter centered at 100 Hz, with four attenuation settings (no attenuation, -1.5 dB, -3 dB, and -6 dB) so that you can account for the boundary bass boost that occurs when the monitor is placed near a wall or corner. If you don't want to roll off those lows, set it to 0 dB. You also can adjust the Sceptre's overall sound and response using its performance controls. Finally, the power amplifiers have a "soft startup" so that you don't get damaging pops in the speakers when you power them up.